In around about a month's time (Saturday the 22nd and Sunday 23rd February), the third annual Surrey Steampunk Convivial will be celebrating it's actualization with a full weekend of Steampunkery at the not too far away (although it is on the other side of the A3) Royal Oak Function halls in New Malden, KT3 4RD, Great Britain (where else?). "Steampunk is a movement based loosely around science fiction of the Victorian period, influenced by the writings of authors such as Jules Verne and HG Wells. The style may be seen in such movies as 'The League of Extraordinary Gentlemen', 'The Three Musketeers' and the new Sherlock Holmes movies. 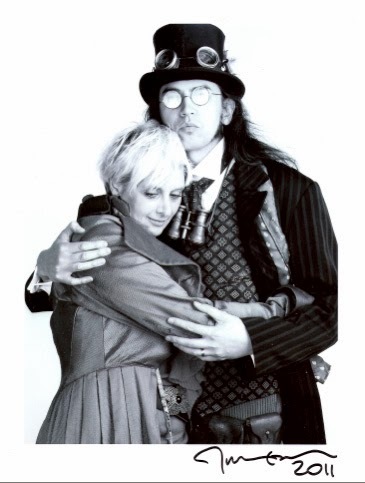 Steampunk style of dress is adopted by many, with corsets, top hats, waistcoats and goggles. Steampunk is a movement for all ages, with enthusiasts ranging in age from 6 to 60, so no matter how old or young you are, Steampunk has something for you." 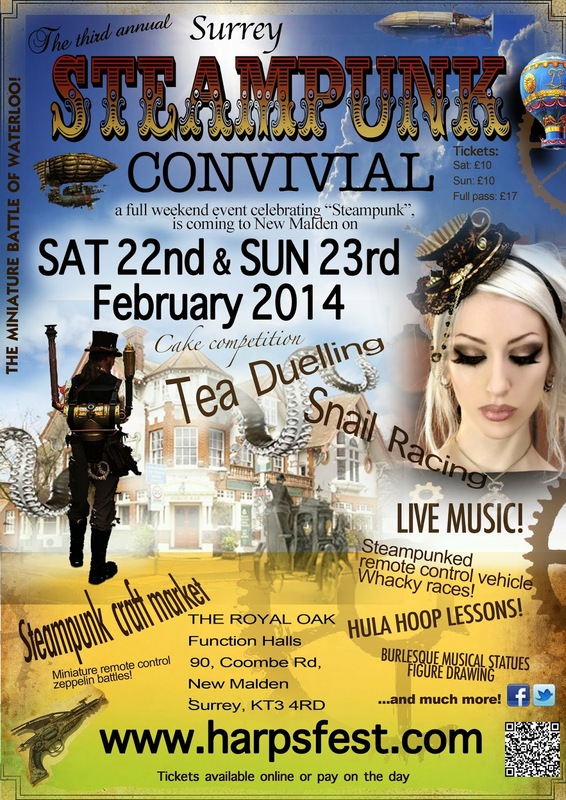 The event is organised by The Nonsuch Steampunk Guild, based in Worcester Park's Epsom quadrant. The weekend will include afternoon events at The Royal Oak, and Christchurch in New Malden, with a Steampunk makers market full of handmade clothing, jewellery and other items for sale, a shadow puppet workshop, Hula hoop lessons, a miniature battle of Waterloo, tea-duelling (a traditional steampunk sport), several "Genius Judges" Steampunk World Record attempts, a Victorian strong man act, cut throat barber, Penny Farthings, a Dalek, and snail racing (snails permitting). There will also be an art and sculpture exhibition, miniature zeppelins, talks, book readings and workshops. A selection of original music with be provided throughout the weekend for your aural pleasure (stop sniggering at the back) including steampunk artists Tom Slatter and Moth, Metropolis, Birthrite, Marianna Harlotta, and Choro Bandido, Catherine Paver, Richard Stickney and the Loopist. DJing from DJ Sludge Van Diesel with black and white projections by Prof. Kit Krakenspine will round up what will be a wonderfully whacky weekend, and a fantastic opportunity to find out more about the increasingly poplar Steampunk movement. For more information, visit the event website at: http://www.harpsfest.com/ or their facebook page here. or £17 for both days.